Segal, Gerald A. - Component of : Early Ideas in the History of Quantum Chemistry. Gerald A. Segal was born Pittsburgh, Pa, USA in 1934. He got his A.B. in 1956 at Amherst College. 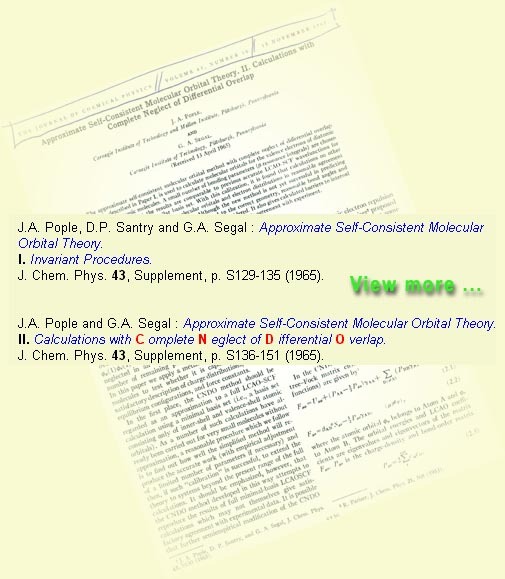 Segal:"After some adventures in business, I entered graduate school where CNDO was my Ph.D. thesis (Thesis Subject: Semi-empirical Molecular Orbital Theory); I was John Pople's first American student ..."
Together with Pople the famous papers on CNDO in 1965. Segal obtained his Ph.D.in 1966, Carnegie Mellon University. 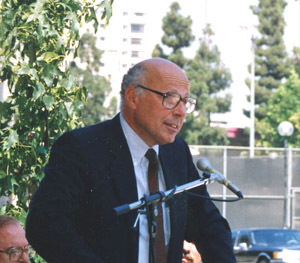 Gerald A. Segal (ed.) : Semiempirical Methods of Electronic Structure Calculation. Plenum Press, New York, 1977. Contributors: Conolly, Evans, Freed, Klopman, Marieu, Trinastic, Tully, Warshel. 1956 B.A. Amherst College, Amherst Mass. 1957-1963 Businessman, City Drug Stores, Pittsburgh Pa.
1966-1967 Postdoc with A.D. Buckingham,Bristol, GB. G.A. Segal, Ed., "Semiempirical Methods of Electronic Structure Calculations, Part A: Methods", 274 pp. Plenum Press, New York (1977). Edition in Russian Translation, Mir Press, Moscow, 1980. G.A. Segal, Ed., "Semiempirical Methods of Electronic Structure Calculations, Part B: Applications", 309 pp. Plenum Press, New York (1977). Edition in Russian Translation, Mir Press, Moscow, 1980. 1. J.A. Pople, D.P. Santry and G.A. Segal, "Approximate Self-consistent Molecular Orbital Theory. I. Invariant Procedures", Journal of Chemical Physic 43, S129 (1965). 2. J.A. Pople and G.A. Segal, "Approximate Self-consistent Molecular Orbital Theory. II. Calculations with Complete Neglect of Differential Overlap", Journal of Chemical Physics 43, S136 (1965). 3. J.A. Pople and G.A. Segal, "Approximate Self-consistent Molecular Orbital Theory. III. CNDO results for AB2 and AB3 Systems", Journal of Chemical Physics 44, 3289 (1966). 4. G.A. Segal, "CNDO/2 Molecular Calculations with Complete Neglect of Differential Overlap", QCPE Computer Program 91, distributed through the Quantum Chemistry Program Exchange, Indiana University (1966). 5. D.P. Santry and G.A. Segal, "Approximate Self-consistent Molecular Orbital Theory. IV. Calculations on Molecules Including the Elements Sodium through Chlorine", Journal of Chemical Physics 47, 158 (1967). 6. G.A. Segal, "Calculations of Equilibrium Bond Lengths by the CNDO Method", Journal of Chemical Physics 47, 1876 (1967). 7. G.A. Segal and M.L. Klein, "Calculations of Dipole Moment Derivatives by the CNDO Method", Journal of Chemical Physics 47, 4236 (1967). 8. A.D. Buckingham and G.A. Segal, "Calculation of the Magnetic Rotation Spectrum of NO in the Near Infrared", Journal of Chemical Physics 49, 164 (1968). 9. N.S. Hush and G.A. Segal, "Semi-empirical SCF-MO Calculations of the Electronic Structures of CH3F and CH3F-: Their Significance in Adiabatic Electrode Processes Involving Bond Breaking", Discussions of the Faraday Society 45, 23 (1968). 10.G.A. Segal, R. Bruns and W.B. Person, "Calculation of the Vibrational Intensities of F2CO", Journal of Chemical Physics 50, 3811 (1969). 11.G.A. Segal, "An Alternative Technique for the Calculation of Single Determinant Open Shell SCF Functions which are Eigenfunctions of S2", Journal of Chemical Physics 52, 3530 (1970). 12.C.R. Claydon, G.A. Segal and H.S. Taylor, "Theoretical Interpretation of the Electron Scattering Spectrum of CO2", Journal of Chemical Physics 52, 3387 (1970). 13.G.A. Segal, "On the Calculation of Wavefunctions for the Lower Excited States of Polyatomic Molecules", Journal of Chemical Physics 53, 360 (1970). 14.R.A. Beaudet, C.C. Cheung and G.A. Segal, "CNDO Calculations of Carboranes", Journal of the American Chemical Society 92, 4158 (1970). 15.C.R. Claydon, G.A. Segal and H.S. Taylor, "Theoretical Interpretation of the Optical and Electron Scattering Spectrum of H2O", Journal of Chemical Physics 54, 3799 (1971). 16.D.C. McKean, R.E. Bruns, W.B. Person and G.A. Segal, "Vibrational Intensities of F2CO: Some Corrections", Journal of Chemical Physics 55, 3890 (1971). Approximation, Hartree-Fock and Single Excited Configuration Interaction Methods of Computing Excitation Properties of Some Molecules", Journal of Chemical Physics 56, 1520 (1972). 18.A. Chutjian and G.A. Segal, "Theoretical Interpretation of the Optical and Electron Scattering Spectra of Polyatomic Molecules III. N2O and the Discovery of Resonant Phenomena in the B Region at 6.8 eV", Journal of Chemical Physics 57, 3069 (1972). 19.G.A. Segal, "Comments on Computations on Large Molecules" in "Proceedings of the IBM Research Symposium on Computational Methods for Large Molecules and Localized States of Solids", Plenum Press, N.Y. (1973). 20.D. Yeager, V. McKoy and G.A. Segal, "HRPA Calculations on the Excited States of H2O", Journal of Chemical Physics 61, 755 (1974). 21.G.A. Segal, "An ab initio Study of the Pyrolysis of Cyclobutane via the Tetramethylene Diradical", Journal of the American Chemical Society 96, 7892 (1974). 22.L. Salem, C. Leforestier, G.A. Segal and R. Wetmore, "On Surface Crossings", Journal of the American Chemical Society 97, 479 (1975). 23.D. Grimbert, G.A. Segal and A. Devaquet, "An ab initio SCF Study of the Photochemical Disrotatory Closure of Butadiene to Cyclobutene", Journal of the American Chemical Society 97, 6629 (1975). 24.G.A. Segal and R.W. Wetmore, "An Efficient Method for Large Scale Configuration Interaction Calculations", Chemical Physics Letters 32, 566 (1975). 25.R.W. Wetmore and G.A. Segal, "Efficient Generation of Configuration Interaction Matrix Elements", Chemical Physics Letters 36, 478 (1975). 26.R.E. Townshend, G. Ramunni, G.A. Segal, W.J. Hehre and L. Salem, "Organic Transition States. V. The Diels Alder Reaction", Journal of the American Chemical Society 98, 2190 (1976). 27.H.S. Taylor, E. Goldstein and G.A. Segal, "Resonance States of HCl- and Electron - HCl Scattering Processes", Journal of Physics B: Atomic and Molecular Physics 9, 2253 (1977). Reactions", Nouveau Journal de Chimie, 1, 335 (1977). 29.G.A. Segal, R.W. Wetmore and K. Wolf, "Effcient Methods for Configuration Interaction Calculations", Chemical Physics, 30, 269 (1978). 30.E. Goldstein, G.A. Segal and R.W. Wetmore, "Configuration Interaction Calculation on the Resonance States of HCl-", Journal of Chemical Physics, 68, 271 (1978). 31.D.H. Liskow and G.A. Segal, "ab Initio Theoretical Calculations on the Circular Dichroism Spectra of Trans-Cyclooctene", Journal of the American Chemical Society, 100, 2945 (1978). 32.E. Goldstein, V. Saraswathy and G. A. Segal, "ab Initio Calculations on the Absorption and Magnetic Circular Dichroism Spectra of Cyclopropane", Journal of the American Chemical Society, 102, 6198 (1980). 33.G.A. Segal and K. Wolf, "Theoretical Calculations of the Potential Curves of HF below 14 eV", Chemical Physics 56, 321 (1981). 34.G.A. Segal and K. Wolf, "Electron Scattering from HF", Journal of Physics B: Atomic and Molecular Physics, 14, 2291 (1981). 35.G.A. Segal, "On the Calculation of Low Lying Resonances in Polar Molecules", Journal of Chemical Physics, 76,2111 (1982). 36.V. Saraswathy, J.J. Diamond and G.A. Segal, "Theoretical Calculation of the Lowest Electronic Excited States of BO2",Journal of Physical Chemistry, 87, 718 (1983). 37.W. Duch and G.A. Segal, "Theoretical Calculations on the Absorption and Magnetic Circular Dichroism Spectra of a Jahn Teller Distorted Excited State: The 1E' Excited State of Cyclopropane", Journal of Chemical Physics, 79, 2951 (1983). 38.J.J. Diamond and G.A. Segal, "The Vertical Excited States and Magnetic Circular Dichroism Spectra of Allene", Journal of the American Chemical Society, 106, 952 (1984). 42.M.A. Lowe, G.A. Segal and P.J. Stephens, "The Theory of Vibrational Circular Dichroism: Trans-1,2- Dideuteriocyclobutane and Propylene Oxide", Chemical Physics Letters, 123, 108 (1986). 43.G.A. Olah, R. Herges, Khosrow Laali, and G.A. Segal, "Onium Ions. 34. The Methoxydiazonium Ion: Preparation, 1H,13C,15N NMR and IR Structural Studies, Theoretical Calculations, and Reaction with Aromatics. Attempted Preparation and the Intermediacy of the Hydroxydiazonium Ion., Journal of the American Chemical Society, 108,2054 (1986). 44.V. Marudarajan and G.A. Segal, "A Configuration Interaction Study of Some Potential Energy Surfaces Important to Photodissociation in NCNO, Chemical Physics Letters, 128,1 (1986). 45.S. Nagamani and G.A. Segal, "Effect of Aqueous Solvation upon the Electronic Excitation Spectrum of the Glycine Zwitterion: An ab initio CI Study Using a Fractional Charge Model", Journal of the American Chemical Society, 108, 6880 (1986). 46.L. Salem, X. Chapuisat, G.A. Segal, P. Hiberty, C. Minot, C. LeForestier, and P. Sautel, "Chirality Forces", Journal of the American Chemical Society, 109,2887 (1987). 47.J. de Juan, S Callister. H. Reisler, G.A. Segal and C. Wittig, "H + ClCN --> HCL + CN: Product Excitations and Reaction Mechanism at Ec.m. = 90 kJ mol-1. Journal of Chemical Physics, 89,1977 (1988). 48.Y.Y. Bai and G.A. Segal, "Calculated Potential Energy Surfaces for the Electronic States of NCNO That Dissociate to the Products CN (X 2R) + NO (X 2P), Chemical Physics Letters, 151, 31 (1988). 49.G.A. Olah, J.W. Bausch, G.K. Surya Prakash, G.A. Segal, P.S. Gregory and P.v R. Schleyer, "Methylated Biphenylene Dianions: NMR Spectroscopic and Theoretical Investigation", Journal of the American Chemical Society, 111, 3633 (1989). 51.G.A. Segal, "CNDO/2, An Approximation to the Hartree Fock Theory", Current Contents, 29, 14 (1989). 52.Y.Y. Bai and G.A. Segal,"Features of the Electronic Potential Energy Surfaces of Nitric Acid Below 7 eV", Journal of Chemical Physics, 92, 7479 (1990). 53.G.A. Segal, "John Pople: The CNDO and Indo Methods", Journal of Physical Chemistry, 94, 5436 (1990). 54.Y.Y. Bai, G.A. Segal and H. Reisler, "Ab Initio Calculations of Dissociative Electronic States of ClCN: Implications to the Photodissociation Dynamics of the Cyanogen Halides", Journal of Chemical Physics, 94, 331 (1991). Copyright © Jan. 19, 2002 by U. Anders, Ph.D.